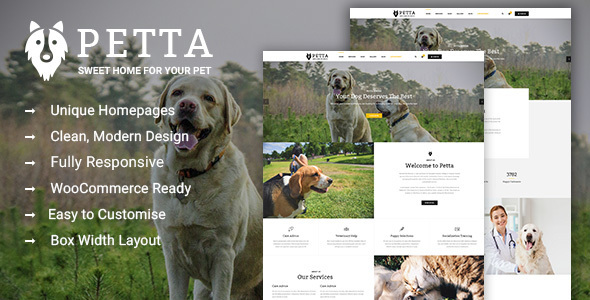 Petta is a Premium Pet Care WordPress Theme which is best suited for pet care websites, pet shops, stylish and gracious, elegant and refined, aesthetically minimal and sophisticated, experientially designed and very feature-rich and intuitively navigable, gorgeous and seamless, fast loading and lightweight, easily customizable and very modern and polished, highly responsive WordPress multipurpose business website. Petta is a classy and tasteful WordPress theme, a purposeful, specific solution for webmasters rookie and seasoned alike to easily and effortlessly be able to set up the most modern and engaging equestrian business websites on the market today. Petta comes packaged with the premium Visual Composer page builder plugin, as well as a whole slew of custom developed, unique and delightfully convenient elements and features crafted just for Petta. With WooCommerce integration out of the box, marketing your pet products or services through your Petta website has never been easier, while pet’s clean, minimal aesthetic makes it superbly easy to customize in a meaningful fashion while plugins like The Event Calendar and Revolution Slider take it home. Try Petta today, and feel the power! Nowadays, when most business owners turn to the Internet to sell their products and services, having a powerful, yet simple to use online store is absolutely vital if you take your business seriously. This is why Petta comes with WooCommerce, the most popular eCommerce plugin that makes managing your online store and handling shipping, payments and even taxes easier than ever. Petta theme is very easy to install and highly customizable. It includes fluid design and cool features that enable you to create an outstanding website. The theme comes bundled with premium plugins like Slider Revolution and Visual Composer that allows you to display your products in your website with ease. The Visual Composer is a very responsive drag and drops functionality that lets you arrange and manage the placement of each element within your theme, while the Revolution Slider assists you in adding fantastic slides with wonderful animations in your website. It helps you easily customize your website and create a design for your website that suits your brand without touching a single line of code. The theme comes packed with custom widgets and powerful shortcodes that allow developers to arrange and set up theme elements without difficulty. Petta WooCommerce Theme is full of rich features for your business. You can change or adjust almost every aspect of this website template with its intuitive theme options. There are eight header Layouts to select and Sticky Header – a fixed header when scrolling. If you are at the bottom of a webpage and want to go to another page, but it is too lazy to scroll all the way back up to the top to select a menu item. With Petta’s sticky header, you no need to do that. Your main menu and logo will always be at the top of the screen, automatically following when you scroll. And you can easily turn the sticky header on or off in theme options panel. It’s one thing to develop a responsive theme, but it’s something else entirely to develop a theme that leaves your visitors breathless, regardless of the device they’re using to access the internet. Petta is a fully responsive theme that seamlessly adapts to any screen size and unleashes the full potential of each pixel thanks to Bootstrap 3 – a powerful framework that guarantees an impressive performance. Even the smallest elements have been tweaked to perfection, turning your website into a crisp, detailed visual experience to behold. It is fully responsive and mobile-ready to ensure that your website will look stunning and work smoothly across all modern devices to give your users an amazing viewing experience. Why limit yourself to a physical store, when the internet can give you an international platform? Petta is an impressive WordPress theme for eCommerce websites. It is practical, versatile, and extremely user-friendly. Regardless of your market niche, you will be able to create an impressive online shop. This is made possible by WooCommerce, one of the most popular premium plugins on WordPress. The installation process is brief, and no advanced technical knowledge is required. With Petta, it is easy to handle payments, shipping and taxes. Many extraordinary features were included, along with a cool design that will never become outdated. This theme can showcase products in a very attractive manner, given that it incorporates the Visual Composer and Slider Revolution plugins. Powerful widgets and personalized shortcodes were included, making it easier for developers to organize the site elements. Every single aspect of your page can be changed, in order to fit your specifications. In total, there are 8 different header layouts, along with a sticky header that persists even while scrolling. Your logo and the main menu will remain at the top of the page while the customer is browsing through content. This sticky function can be easily disabled by accessing the Options Panel. Easy to install and highly customizable. Petta child theme included – allow you to make changes without affecting the original theme’s code, which makes it easy to update your parent theme without erasing your changes. YITH WooCommerce Compare plugin – Is an extension of WooCommerce plugin that allow your users to compare some products of your shop. All products are saved in one complete table where the user can see the difference between the products. YITH WooCommerce Wishlist – Offer to your visitors a chance to add the products of your Woocommerce store to a wishlist page. With YITH WooCommerce Wishlist you can add a link in each product detail page, in order to add the products to the wishlist page. YITH WooCommerce Quick View – You have to open its product page, waiting for its loading and finally observe what you are interested into. So why don’t use a simple way to look immediately at the product’s distinctiveness? Here it is what Quick View can offer you. People are more attracted to what they can see clearly. And often the classic product lists are not enough to understand the real value of a product. That’s when Quick View strikes successfully! Footer – Easily adjust the footer column count from 1 to 4 columns. Font Adjusting – Easily adjust the fonts within the theme with our robust theme customizer. Mega Menus – This theme has built-in support for drop-downs and mega menus. be set globally or even per page! Built on Twitter Bootstrap – Petta uses Twitter Bootstrap. This means that a range of shortcodes are automatically supported. For ease of use you can use the Visual Composer, Easy Bootstrap Shortcode or any other plugins to easily add visuals to your website. Contact Form– this theme includes Contact Form 7 plugin which allows you to manage all your contact forms. Header stick – Sticky Header is a godsend for those people who are tired of scrolling up from the bottom of the webpage to select an other menu item. Richer’s main menu with logo will be following when you scroll and always be at the top of the screen. Now the viewers of your site will be thankful for the fast and easy navigation. And of course, this sticky header feature can be easily enabled/disabled in options panel of your theme. If you have any questions about customization of this theme witch are not covered in the documentation feel free to ask a question in the comment section or support center.